HomeResearchRating Update: Stock Rating B-Positive (4/8/19)-Rogers Communications Inc (RCI). Rating Update: Stock Rating B-Positive (4/8/19)-Rogers Communications Inc (RCI). 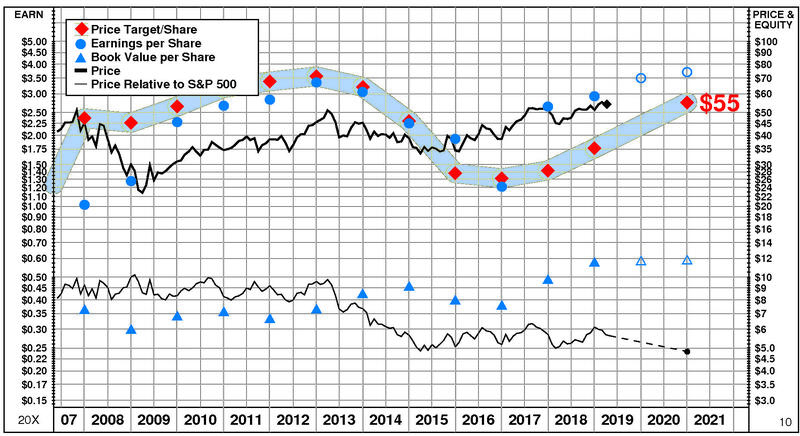 This rating combines inconsistent signals from two proprietary PTR measures of a stock’s attractiveness. Rogers Comm has a neutral Appreciation Score of 41 but a good Power Rating of 85, with the Positive Value Trend Rating the result. Rogers Comm’s stock is selling at targeted value. 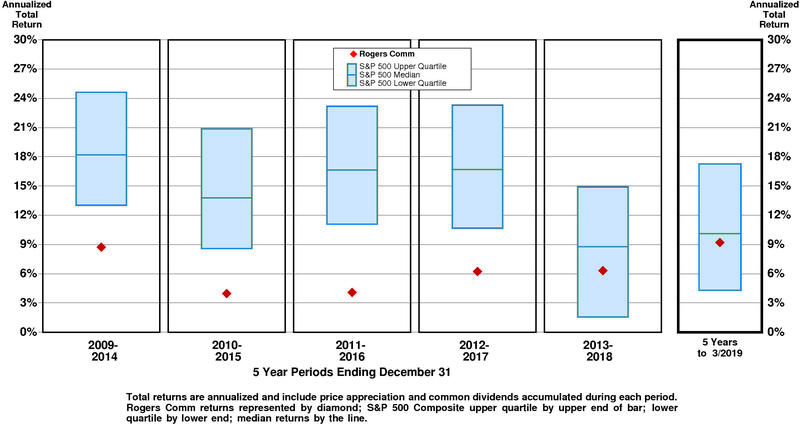 The current stock price of $54.38 compares to targeted value 12 months forward of $53. Recent notable positive changes in investment behavior have benefitted Rogers Communications Inc (NYSE: RCI): its shorter term price trend turned up. 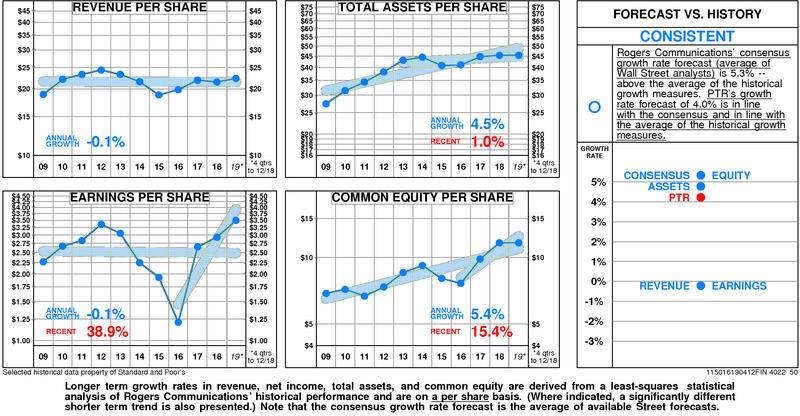 Recent small negative changes in fundamentals have impacted Rogers Communications Inc (NYSE: RCI): significant quarterly sales deceleration occurred. Rogers Communications Inc (NYSE: RCI) stock suffered a major decline of -13.0% on 4/8/19. The shares closed at $0.01. However, trading volume in this decline was unusually low at 63% of normal. The stock has been exceptionally strong relative to the market over the last nine months and has risen 1.0% during the last week. 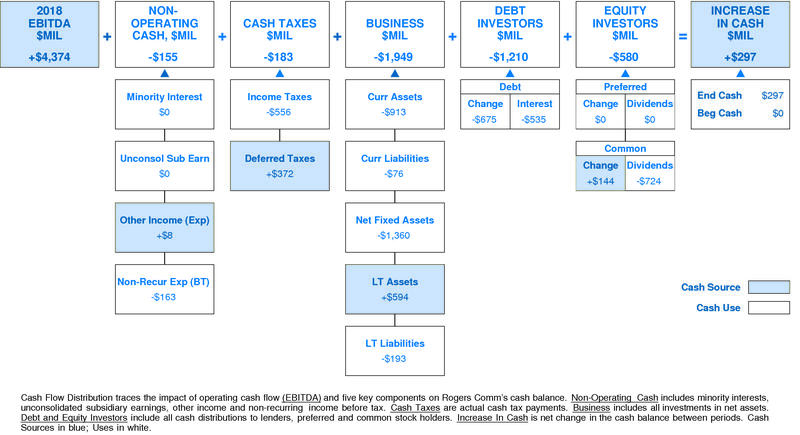 In 2018, Rogers Comm generated a very significant increase in cash of +$297 million (                                ). Sources of cash were much larger than uses. Cash generated from 2018 EBITDA totalled +$4,374 million. Non-operating uses consumed -$155 million (-4% of EBITDA). Cash taxes consumed -$183 million (-4% of EBITDA). Re-investment in the business amounted to -$1,949 million (-45% of EBITDA). On a net basis, debt investors received -$1,210 million (-28% of EBITDA) while equity investors removed -$580 million (-13% of EBITDA). RCI’s return on equity has eroded very significantly since 2009 although it experienced a very sharp recovery after the 2016 low. Over the full time period, Rogers Communications’ stock price performance has been below market. Between June, 2008 and April, 2019, Rogers Communications’ stock price rose +41%; relative to the market, this was a -38% loss. Significant price moves during the period: 1) March, 2015 – February, 2019: +65%; and 2) March, 2009 – March, 2013: +124%. 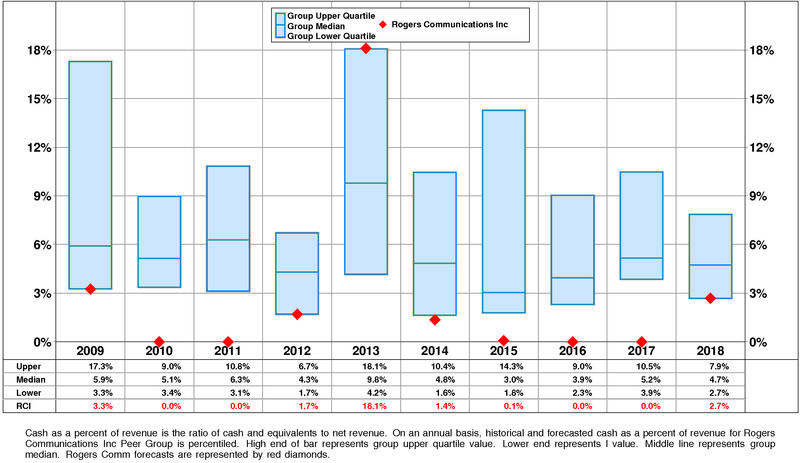 Rogers Comm has a large value gap compared to median valuation. For RCI to fall to lower quartile valuation, its current ratio of enterprise value/revenue would have to decline from the current level of 2.94X to 2.64X. 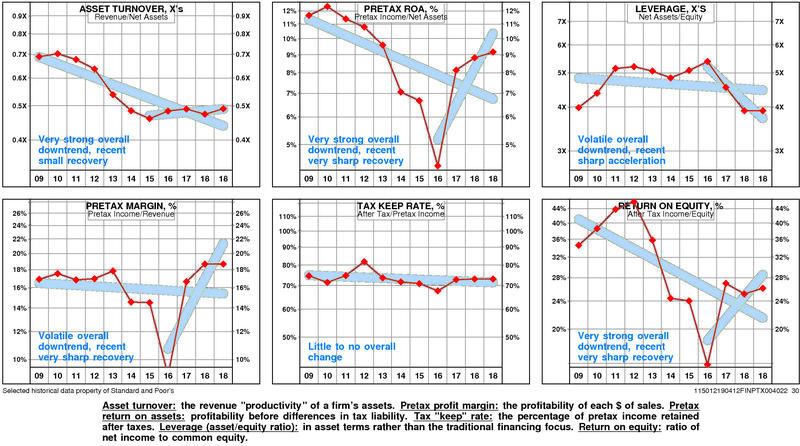 If RCI’s ratio of enterprise value/revenue were to decline to 2.64X, its stock price would be lower by $-9 to $46. 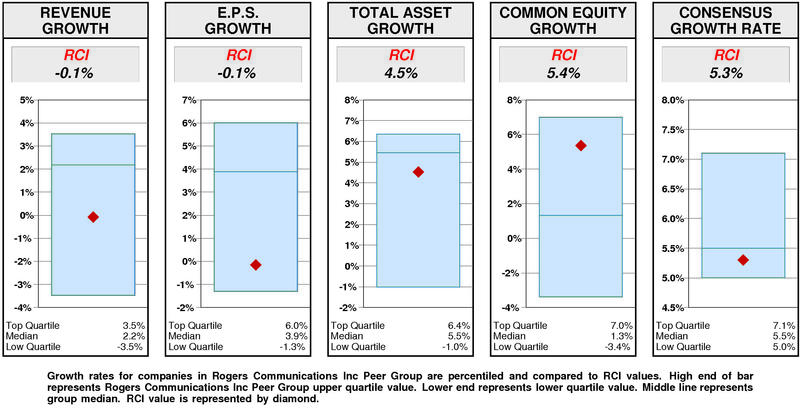 For RCI to achieve upper quartile valuation relative to the Rogers Communications Inc Peer Group, its current ratio of enterprise value/revenue would have to rise from the current level of 2.94X to 3.40X. If RCI’s ratio of enterprise value/revenue were to rise to 3.40X, its stock price would increase by $13 from the current level of $54. Rogers Communications’ current Price Target of $55 is little changed from the current price of $54.38. 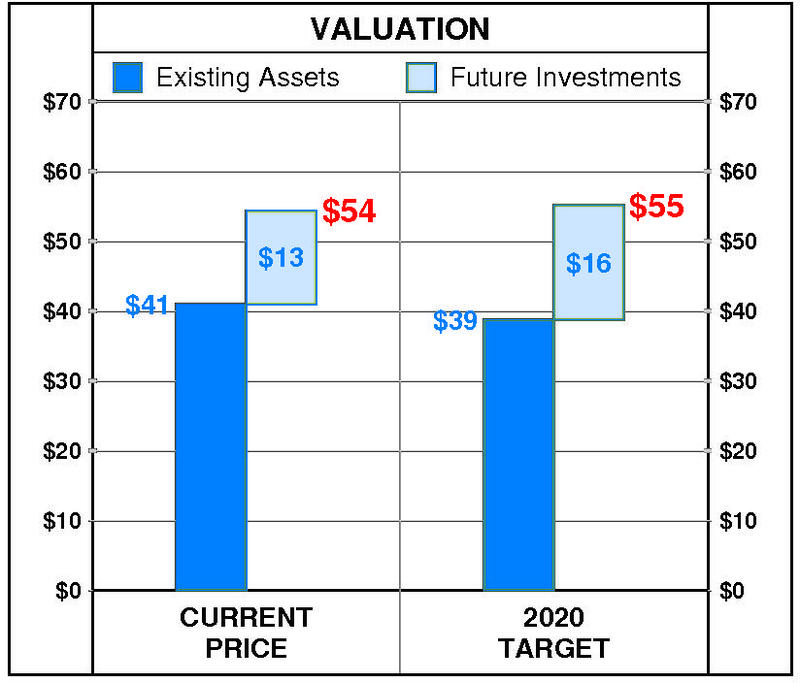 Rogers Communications’ current Price Target is $55 (+57% from the 2018 Target of $35 and +1% from the 04/08/19 price of $54.38). This dramatic rise in the Target is the result of a +2% increase in the equity base and a +54% increase in the price/equity multiple. 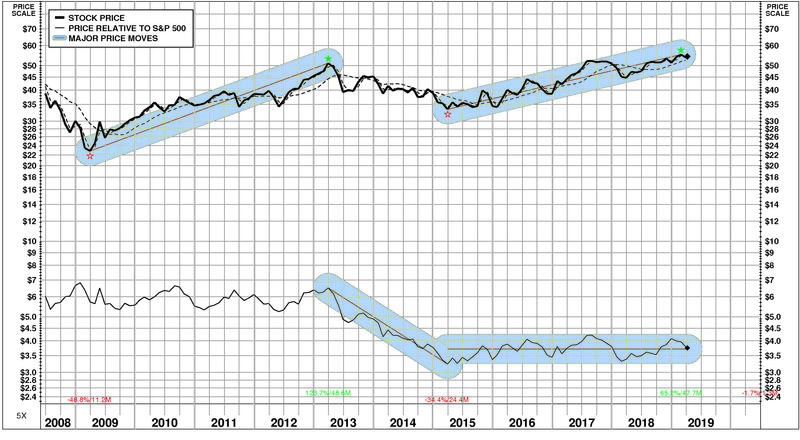 The forecasted increase in growth has a very large positive impact on the price/equity multiple and the forecasted increase in return on equity has a large positive impact as well. Partially offsetting these Drivers, the forecasted increase in cost of equity has a slight negative impact. At Rogers Communications’ current price of $54.38, investors are placing a positive value of $13 on its future investments. This view is consistent with the company’s most recent performance that reflected a growth rate of 0.0% per year, and a return on equity of 26.4% versus a cost of equity of 9.6%. Rating Update: Stock Rating A-Highest (4/8/19)-Mesabi Trust (MSB). 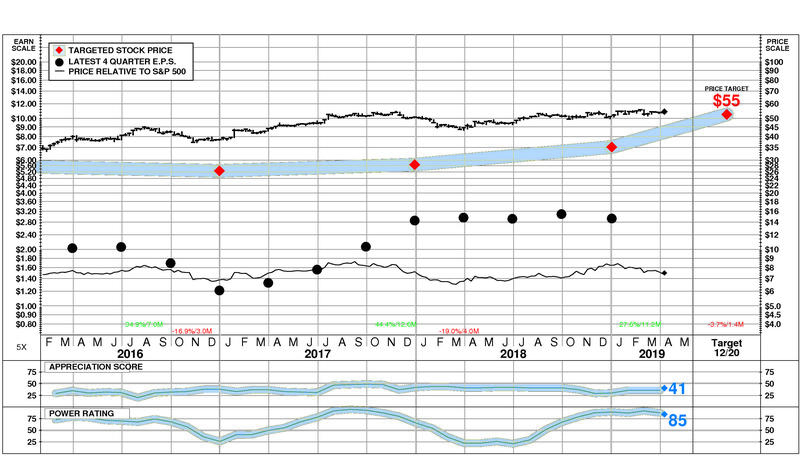 Rating Update: Stock Rating F-Lowest (4/8/19)-Cellular Biomedicine Group Inc (CBMG).